In this project I present a deeply personal narrative that seeks to question the relationships between art, artist and viewer. 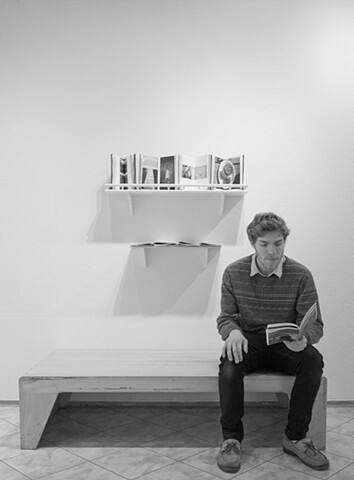 My work consists of four handbound books containing poetry and photographs that are placed on a shelf placed on the gallery wall. In order to extend this experience outside the gallery, I have included sixty copies of each book printed as black and white zines. This installation provides the viewer an intimate and personal experience and my goal is that this one-on-one situation between viewer and artwork will compel the viewer to examine the work at a deeper and more thorough level.